Fabulous photos!! Complimentary colors bien sur...you are the exact same age of my daughter who lives in Aix en Provence..l..I'm sure we will meet one day..c'est tout petit ici!!!! C'est vrai que c'est tellement petit ici...something I love about Provence. Everyone is so much more accessible than they were in Paris or New York...Please do say hello if you see me wandering around Aix or Arles! Summeritis? Haha that is one thing I do not think I suffer from - except the extreme laziness that the season bring about. Have been hoping for the heat-wave to end and we've had rain. Three times since last Saturday! and I am so relieved. It's a but cooler now and I am loving it - for as long as it lasts. Your tomatoes look delicious. I bet they are nice and sweet. Glad you enjoyed your birthday. Nothing tastes better than homegrown tomatoes. Last year I even tried drying them in the oven, but then I didn't know what to do with them. I tried putting them in oil but they just tasted oily. See? That is what I thought too. Good to know as you saved me the experiment! THAT TOMATO TART sounds like the one I sent via MiMi's BOOK! HAPPY BIRTHDAY...................46............How is that possible! It is pretty similar to Madame Mimi's but hers is...of course...more elegant, this one more rustic. We will be taste testing the next round of the Gazpacho Wars today at lunch! Remi is up...and I will keep you posted! First of all, officially, Happy Birthday! 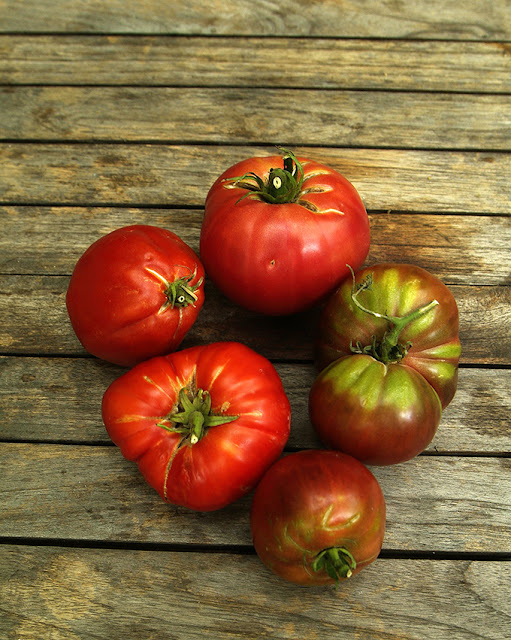 Second, we, too are awash with ripe tomatoes -- or at least our local organic farm is. Yum. I love them sliced on a good piece of sourdough that has been slathered with my own homemade mayonnaise. Any cherry tomatoes in you patch? Well, Wednesday Chef had a luscious foccacia recipe that I recently made that involves pizza dough, fresh mozzarella, chard, anchovies, and, cherry tomatoes. Nice and bready, oozing with cheese. The perfect dinner for a hungry swimmer. I posted a photo of it on Instagram. Anyway, I'm going to try the tomato tart! Oh I missed that on ig and it sounds amazing! You are definitely a foodie and not a Food E like I am. :) Alas, no cherry tomatoes this year - an error on our part as everyone else grows them and they are so incredibly good. Next year hopefully. 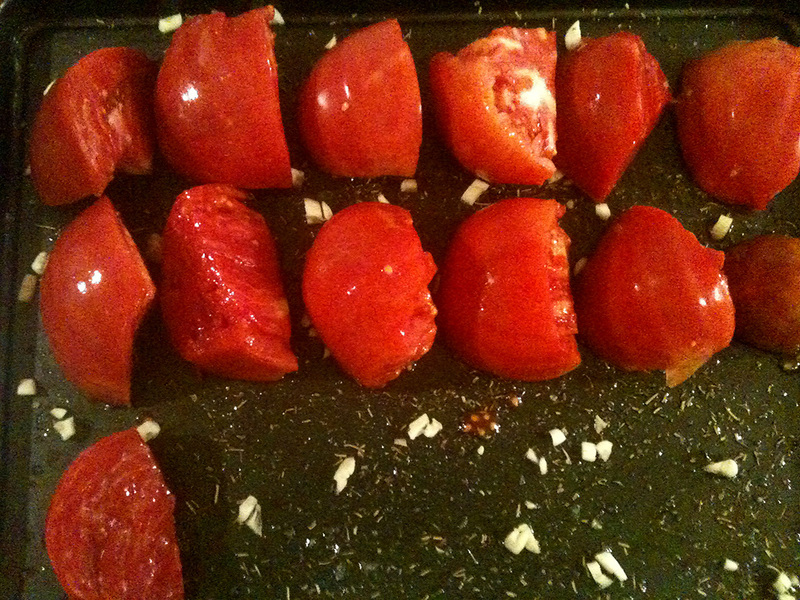 Wow those tomatoes are red, robust & appetizing. I have to taste your tomato tart.Looks so delicious. Your gazpacho has to compete with Mrs. Abstract’s gazpacho. Wishing you a very happy birthday Heather! 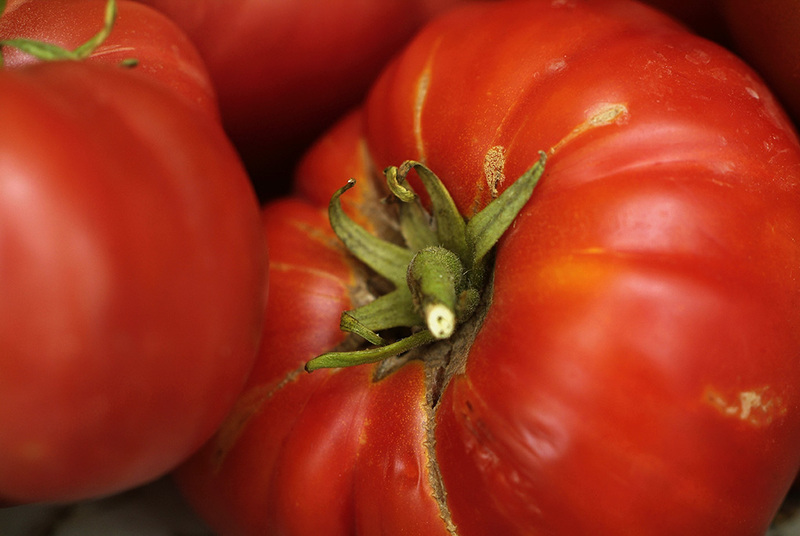 Loved all your tomatoitis in summeritis! Aha moment .. next time the obnoxious telephone talker invades your eardrums, smile .... and give him the biggest tomatoe you can find .. just sayin' :-) Happy Birthday! Happy Birthday, and Best Wishes for many, many more, Heather!! May the celebration continue!! Do the pups like to eat tomatoes? Oh! And it is 22 plants - they call them 'pieds' in French! Sistah, methinks the heat is getting to you, as you are loopy in this post! But in a good way! (You funny). Your tomatoes & dishes look SO GOOD!!! 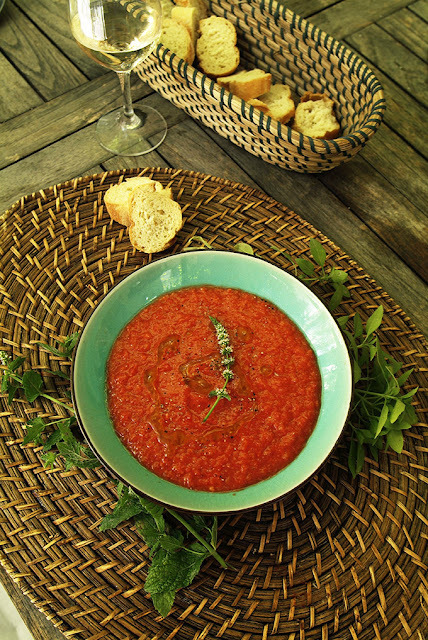 And how much would I love to be the judge of your & Remi's gazpacho contest? A LOT! Thanks for this! I was actually looking for a tomato tart recipe, and now I just have to find some mustard out here in Umbria and I'll be all set. The canicule chez vous is really enormous. I think on the weekend it gets a little tiny bit better. Hopefully for you! Once more HAPPY BIRHTDAY, Heather! You have such good memory, Silke! I need to borrow some of it! ;) Yes, her name is Sophie Lesange but those are just our pretty but cheapy everyday ceramics. Oh this all looks and sounds so delicious Heather, and for someone who no longer cooks all of the time, rather easy!! 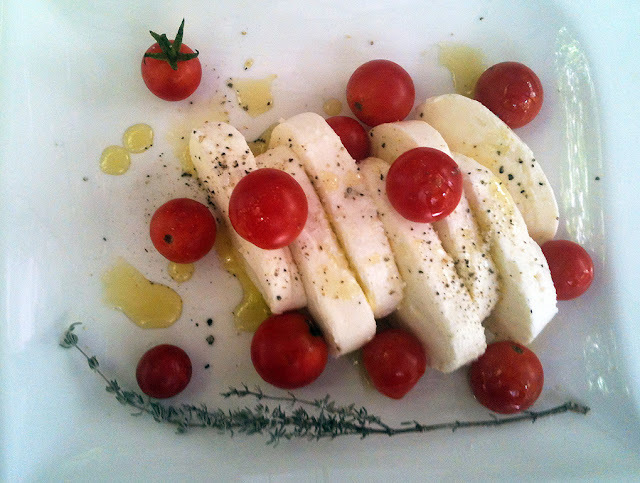 Fresh tomatoes, what can be better!! This is all super duper easy, Karena. That is the only way that I cook! I promise you. And for the feta and tomatoes it is just as good on good bread not toasted - so NO cooking is involved! 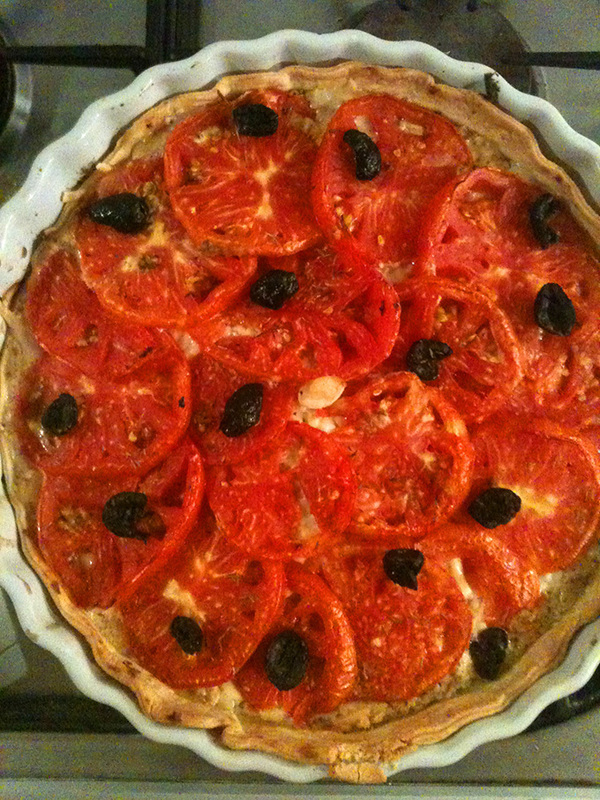 :) And the tart is so easy: tart, mustard, cheese, tomatoes, oven = done! Would you mind if I dove into your bowl of gazpacho and swam around a bit? I am in total tomato rapture over here and wishing that I could just pop by and "borrow" a few from you. 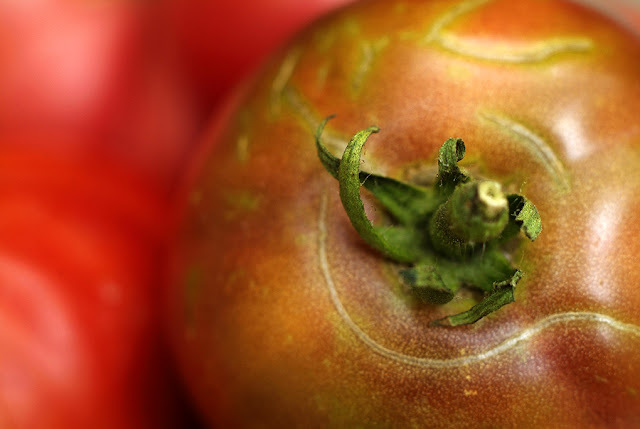 Can we talk about the sad, sad, tomato situation at our silly, expensive, supposed-to-be-superior grocery store (ahem Whole Foods) and the fact that their heirloom tomatoes, although they look pretty, must have been picked when they were green little things and left to ripen in a warehouse somewhere. They have absolutely zero flavor. It's just not right. Clearly I need to get myself to a farmers market... but this has been a summer of sitting and my desk and painting up a storm, without a lot of time for field trips. 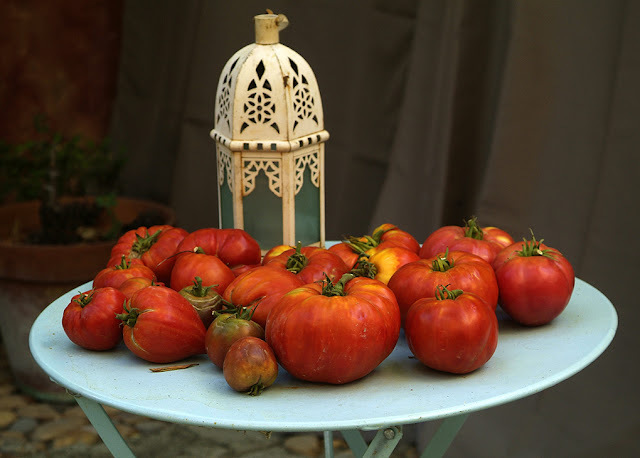 Anyway, enough of my tomato-envy rant and back to your post which is gorgeous and paint-able and not a bit name-droppy. 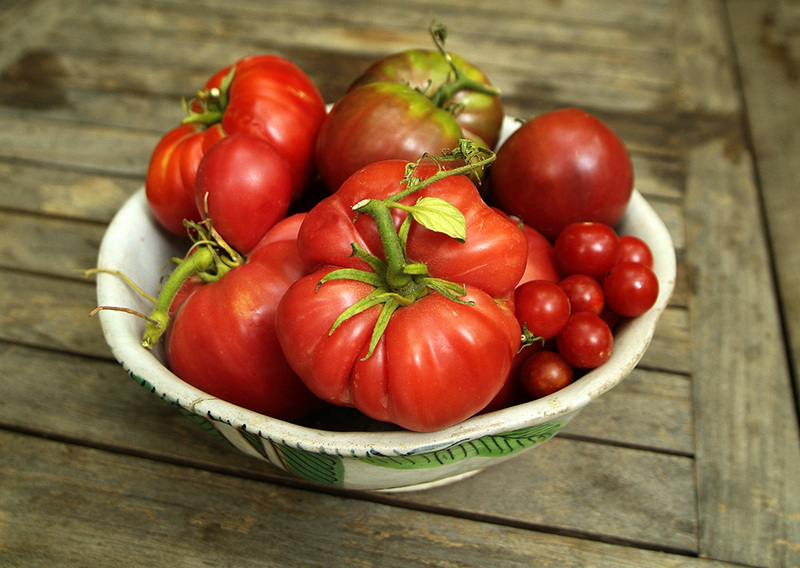 It's gorgeous and makes me so happy to know that these beautiful tomatoes belong to you! Glad you had a happy birthday - love that we are the same age, although I have you beat by a few months. Here's hoping that this is a most delicious year for you!!!!! You are such a sweetie pea. :) And yay for painting up a storm and hopefully selling a whole lot too!!!! And hello? You know that I wish you lived closer - I would shower you in veggie gifts! Happy Belated Birthday to you too! Well, you look at least ten years younger than who you are and let's hear it for a Social Security check! Whooohooo!!!! I would take one, happily. And yes, you will love the tart. Your fruit is GORGEOUS! Enjoy the glut! Revel in it! And I can't wait to try YOUR tomato tart soon... the garlic clove -- yum! Somewhere I have a recipe for tomato-orange marmalade! 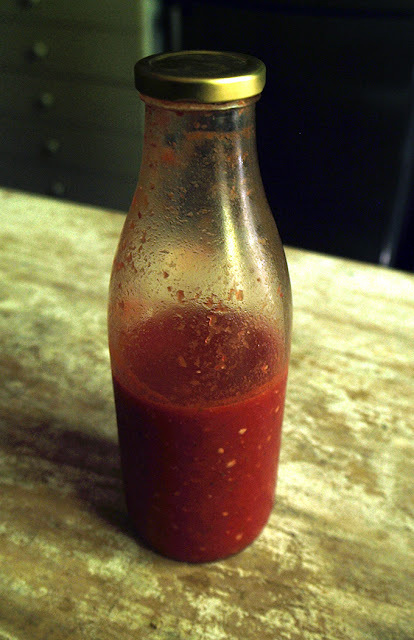 I made it many years ago and it was superb…and a perfect way to use up those tomatoes. Will have to dig it out and do a post! No, you can never have enough of these babies..and I like the "cosmetically challenged" the best! And "cosmetically challenged" is all we have! Oh yum and yum and yum all over again. Favorite really complicated and difficult tomato recipe: Two pieces of really good bread slathered with mayonnaise layered with sliced tomatoes and sprinkled with sea salt. Smoosh together and eat standing at the sink with the juice dripping down your chin. If you are really being fancy, add some basil. O. M. G. a mouthful of summer right there. Loving the tomato pie! 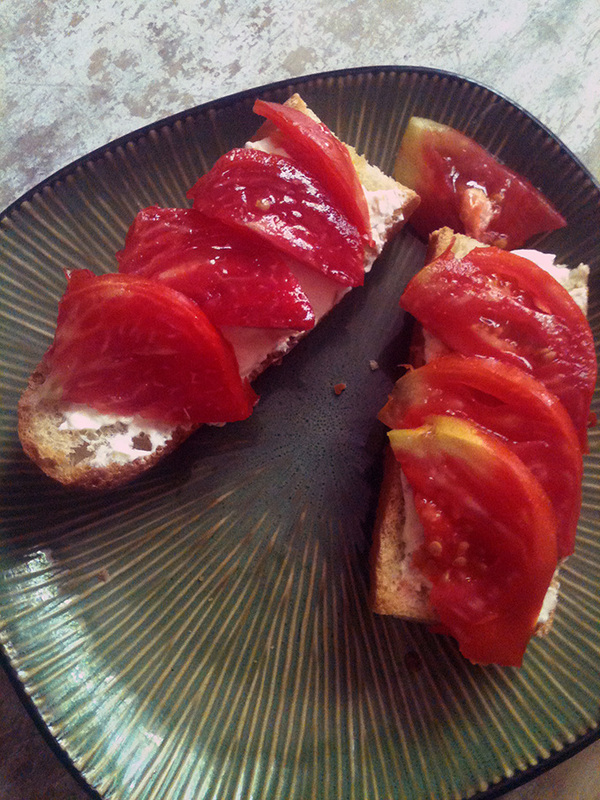 Tomatoes, feta cheese, olive oil, bread, and garlic are my all year favorite foods. The first time I planted tomatoes...well, they were in six packs. Not knowing what kind I wanted, I planted all 18. There were shopping bags of tomatoes given away. Summeritis in full bloom here too- but finally here is the link for the 'soil makes you happy' article! Oh yay! Thank you Lisa!